Using a design drawing from the performance requirements of jazz guitar players, the GB Custom by Douglas Harrison is a versatile, high quality and beautiful instrument. 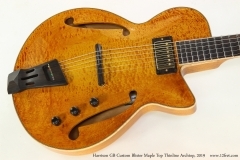 The design goal is a comfortable, compact, feedback resistant body with an archtop’s tonal profile. Here we have a brand new, 2019 Douglas Harrison GB Custom. This model was originally built for the late Toronto jazz guitarist and instructor Gary Benson, and many more have been built since then. This Harrison GB Custom example features a carved Maple, F-hole top with ‘blister’ figuring on a Mahogany body, routed out to provide a fully hollow body. The neck uses three pieces of Mahogany, with a Macassar Ebony for the fingerboard, headplate, tailpiece and bridge. 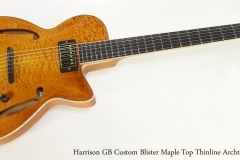 Binding is flamed Maple. Gotoh 510 21:1 ratio tuners with gold tinting provide smooth, accurate tuning. 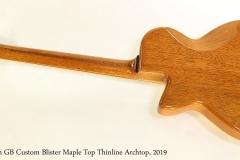 The hand built tailpiece is solid and designed to allow fast string changes. The frets are stainless steel, which significantly reduces the rate of fret wear. For electronics, this guitar has two pickups. A Lindy Fralin Modern PAF humbucker is installed in the neck position, and the bridge contains an EMG AT125U piezo element. A blend control is provided to mix the two, along with standard volume and tone controls; the tone control is a push/pull pot for series/parallel configuration. The finish is clear gloss nitrocellulose lacquer, with an amber tint for the top. Like the joinery throughout the guitar, the finish is very well executed. A black, custom Amertiage hard shell case is included.